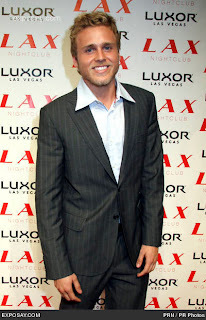 Spencer Pratt....is a fool. Yes I said it. Did you guys hear about his name change? Yeah, the boy actually wants to change his name to KING Spencer Pratt. Spencer, who is never short on words, had this to say about his new name decision: "I've decided since there is a Queen of England and a Prince William that there should be a king of America," he tells Us. "I nominate myself for that role." And apparently Heidi gets a new title too. In a recent interview with The Hills: The After Show, he called her "the new, modern-day, 2010 Michael Jackson," who was famously known as the King of Pop. "Michael Jackson's in heaven," he said. "The Holy Spirit now has extra Michael Jackson juice, so boom! For all we know, Heidi gets possessed with some of that Michael Jackson divine spirit." Ummm.....what?! KING Spencer Pratt?!! Are you freaking kidding me?!! That's worse than Chad Ocho Cinco (which doesn't even mean 85 in Spanish btw...the correct words are ochenta y cinco) Who in the world considers Spencer Pratt to be king of anything?! I might give him king of the douchebags, but definitely not anything else, especially America. This stupidity coming from him does not surprise me, or probably anyone else for that matter. And what's with this Heidi being the modern day Michael Jackson? I swear, ever since Michael Jackson passed, everybody and their mother is trying to compare him to other people...I'm beyond tired. I have nothing against Heidi, even though her husband is a mess, but I saw her performance at the Miss Universe competition....yeah......she ain't nowhere near the Michael Jackson level. She's a tiny bit ahead of the Cassie level (cuz Cassie is at the bottom of my music totem pole), but nowhere near Michael Jackson. Point blank cuz I have homework to do (I'm back in school yall!!! LOL), Spencer is an idiot. He's not a king of anything. And his new name is stupid. Heidi, how can you condone this foolishness? !